When I was growing up, if needed something new to read, I’d just head for the garage. My parents owned hundreds, possibly thousands of books, and there were never enough shelves for them all, so the same dozen cardboard boxes followed us from house to house, rarely, if ever, being unpacked. (Some of them are still there, untouched, after twenty years, and a visit to my parents’ house isn’t complete before I’ve had a chance to go through them yet again.) Rummaging through these boxes was like browsing through a great, if eclectic, used bookshop, and the quality of serendipity I love in such stores was multiplied tenfold—I just never knew what I was going to find. Quite a few of those discoveries have probably ended up on my own shelves, absorbed by now into the rest of my library, to the point where I no longer remember where they came from. And my inner life has been enormously shaped by the authors I found there, which only serves to illustrate the point that if there are books anywhere in a house, a true reader will always find them, like a junkie in search of a fix. One book in particular sticks in my mind, if only because it influenced so much of what came afterward. When I was in seventh grade, my father was browsing in a carton of books—I can’t remember why—and came up with a copy of Douglas R. Hofstadter’s Metamagical Themes, which he said I might like, mostly because of Hofstader’s discussion of the Rubik’s Cube. I liked those chapters a lot, but loved the rest of the book even more, and it’s followed me on every move I’ve made since—I’m looking at my original copy as I write this. It’s pretty worn and tattered by now, and just leafing through it takes me back, as much as any book I own, to the period of ferocious reading that I wrote about yesterday. Metamagical Themas, a collection of Hofstadter’s columns for Scientific American, led me inevitably to Gödel, Escher, Bach: An Eternal Golden Braid and The Mind’s I, and what I found there dazzled me so much that I ended up dedicating my school project that year—an autobiography, printed on dot matrix paper, that ran a hundred pages or more—to Hofstadter himself. Who was this guy, anyway? 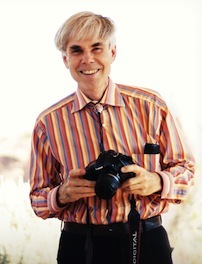 Then as now, Hofstadter was a professor of cognitive science at Indiana University in Bloomington, and his work was my first exposure to a kind of writing that I’ve since come to love passionately: the eccentric, unabashedly nerdy attempt to fuse science and the humanities into something that isn’t quite either, but draws on the best qualities of both. 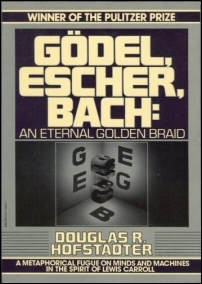 Even now, I don’t think I’ve quite made it through every page of Gödel, Escher, Bach, but what I found there, and in Hofstadter’s other work, has stuck with me ever since. Among other things, he was my first introduction to Zen, self-reference, the Codex Seraphianus, the Skeptical Inquirer, Alan Turing, Magritte, Nabokov’s notes on Eugene Onegin, James Falen’s translation of the same, and countless other authors and concepts I’ve been mulling over ever since, not to mention the larger subjects of consciousness and artificial intelligence. The range of his references is so rich, in fact, that he was later compelled to write another—and somewhat less interesting—book, I Am a Strange Loop, to clarify what he was trying to say in the first place. I discovered Hofstadter in the same year as Umberto Eco, and they’ve acted on my life in similar ways, one on the side of science, the other of literature. (From an intellectual standpoint, it’s likely that ninety percent of what I care about as an adult was formed in middle school, although those aren’t exactly years I’d like to revisit.) Both are polymaths who opened me up to surprising influences and countless other books, and if my decision to major in classics in college was ultimately due to Eco, I’d be lying if I said I didn’t take also a long hard look at cognitive neuroscience. Since then, I’ve become more aware of Hofstader’s limitations—his own translation of Eugene Onegin is a misguided vanity project of the worst kind—but I remain in awe of his brilliance and intellectual omnivorousness. The book of his I treasure the most is Le Ton beau de Marot, which came out when I was a college freshman, leading to many late evenings in my dorm, with my roommate and I trading rival translations of “Ma Mignonne.” There are other writers I’ve come to love more, but few who fill me with such gratitude. If you haven’t read his stuff, you might want to give it a try—he might change your life, too. yes! i read hofstadters columns when i was 13 and one in particular on the prisoners dilemma shapes my thoughts still.